Set in a storybook Connecticut town populated with an eclectic mix of everyday folks and lovable lunatics, "Gilmore Girls" is a humorous multigenerational series about friendship, family and the ties that bind. Now beginning its seventh season, the series revolves around thirtysomething Lorelai Gilmore (Lauren Graham, "Bad Santa" and the upcoming "Evan Almighty") and her college-age daughter, and best friend in the world, Rory (Alexis Bledel, "The Sisterhood of the Traveling Pants," "Tuck Everlasting"). Lorelai has made her share of mistakes in life, but she has been doing her best to see that Rory doesn't follow in her footsteps. That may be easier said than done, considering that the two share the same interests, the same intellect, the same coffee addiction and the same eyes. From the beginning, this unique mother-daughter team has been growing up together. Lorelai was just Rory's age when she became pregnant and made the tough decision to raise her baby alone. This defiant move, along with Lorelai's fiercely independent nature, caused a rift between her and her extremely proper, patrician, old-money parents, Emily (Kelly Bishop, "Dirty Dancing") and Richard (Edward Herrmann, "The Cat's Meow"). However, Lorelai was forced to reconcile with them when she found herself in desperate need of money for Rory's tuition. At the end of season six, Lorelai's elation over her engagement to diner-owner Luke Danes (Scott Patterson, "Little Big League") turned to frustration when he learned of the existence of his 12-year-old daughter, April (guest star Vanessa Marano). Luke asked Lorelai to be patient while he came to terms with this life-changing discovery. After difficult months of giving Luke all the time and space she could, Lorelai delivered a tearful now-or-never ultimatum. Bristling under her emotional demand, Luke let Lorelai walk out of his life. A heartbroken Lorelai took comfort in the arms of her old flame and Rory's father, Christopher Haden (guest star David Sutcliffe, "I'm With Her"). Rory also faced a tumultuous year, dropping out of Yale after her dreams of becoming a journalist were dashed by newspaper mogul Mitchum Huntzberger (guest star Gregg Henry), who just happens to be the father of her boyfriend, Logan (Matt Czuchry, "Eight Legged Freaks"). Rory's reckless behavior led to an unusual and painful parting of the ways between mother and daughter. After a few months spent organizing DAR events for Emily, Rory realized she belonged back at Yale, and she and Lorelai joyfully reunited. Rory and Logan then faced their toughest challenge when she learned of his infidelity during a brief separation. Unable to forgive him at first, Rory realized her love for Logan could overcome even such a serious mistake when he was badly injured in a childish "Life and Death Brigade" stunt. As season six ended however, the two faced a devastating separation when Logan was forced by his father to move to London to take his place in the family's empire. Rory now begins her senior year at Yale and continues as editor of the Yale Daily News without Logan's supportive presence. As season seven unfolds, Lorelai and Rory will turn to one another to get through the complications in their respective romances. It may be that Lorelai's relationship with Luke has been irretrievably marred now that she has once again let Christopher come between them. Even so, she and Luke still have to co-exist in tiny, close-knit Stars Hollow with the town's watchful eyes on them and all their charged history. Meanwhile, Rory will attempt to keep her long-distance romance with Logan alive, even though communication has never been their strong suit, and London is far away. 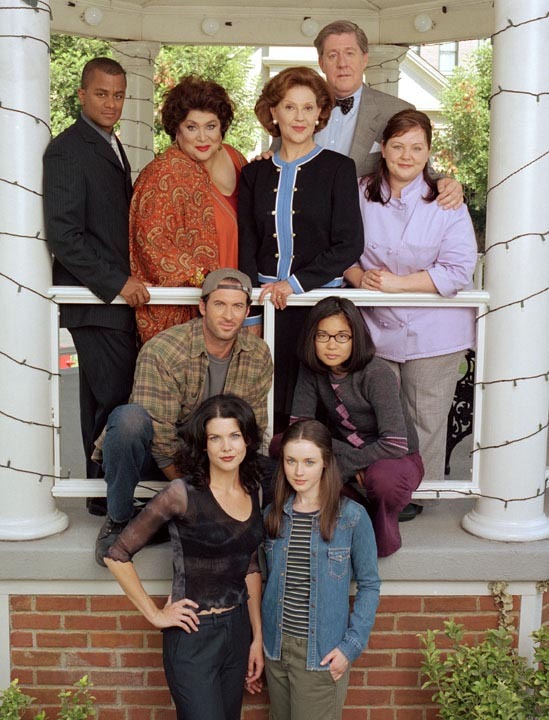 Continuing to add to the unmistakable style of Stars Hollow is a colorful roster of town characters, including Lorelai's best friend and business partner Sookie St. James (Melissa McCarthy), Miss Patty (guest star Liz Torres, "The John Larroquette Show"), the local dance teacher and social commentator, Michel Gerard (Yanic Truesdale), the haughty concierge of the Dragonfly Inn, and Kirk (Sean Gunn, "Pearl Harbor"), the town's jack-of-all-trades and master of none. Rory's two best friends are her intense classmate Paris Geller (Liza Weil, "Stir of Echoes") and childhood pal Lane Kim (Keiko Agena, "Felicity"), who just married fellow musician, Zack (guest star Todd Lowe), in a typically quirky Stars Hollow celebration. "Gilmore Girls" was the first series to make it to air supported by the Family Friendly Forum's script development fund. The strong and loving mother-daughter relationship portrayed in "Gilmore Girls" reflects the growing reality of this new type of American family. This heartfelt one-hour comedy was created by Amy Sherman-Palladino ("Roseanne"). David S. Rosenthal ("Spin City," "Ellen") serves executive producer on the series produced by Hofflund/Polone in association with Warner Bros. Television. Also credited as executive producers are Amy Sherman-Palladino and Gavin Polone ("Stir of Echoes," "Drop Dead Gorgeous").